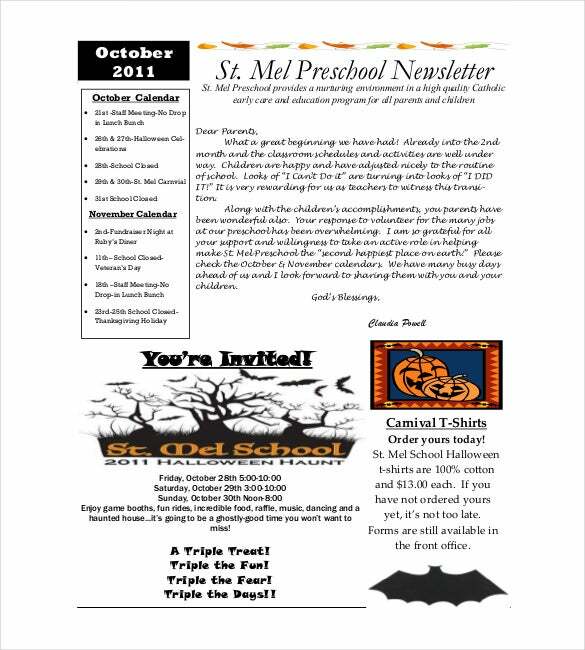 10+ Preschool Newsletter Templates – Free Sample, Example, Format Download! The preschool newsletters are sent by preschools to parents to notify them about the different programs of the institution. 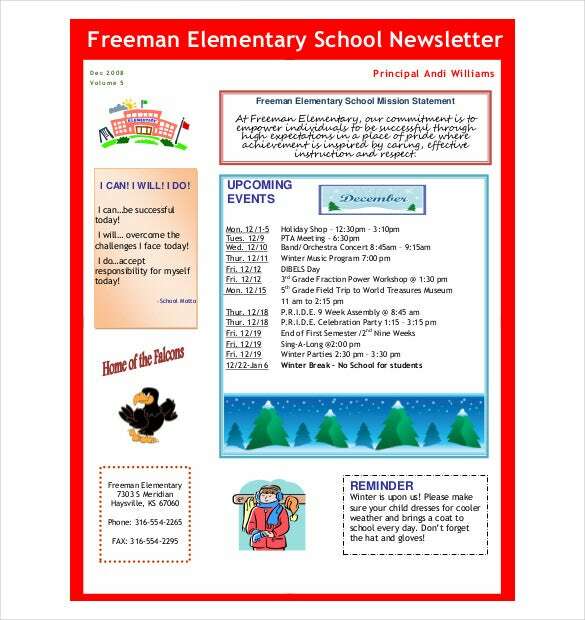 It could be sent monthly or quarterly or semi-annually and you have school newsletter templates to help you in creating a preschool newsletter easily. You can use it to inform about any event you are about to hold in your school or some news reports pertaining to your institution. 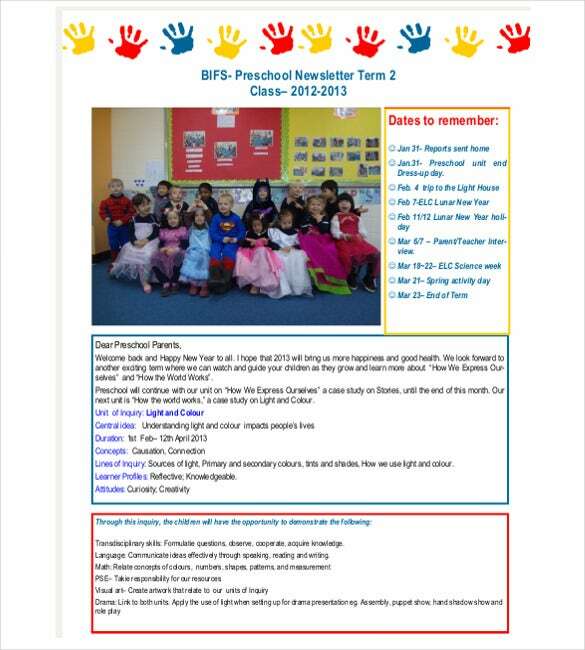 The preschool newsletter templates PDF generally come up with vibrant borders and cute illustrations. These newsletter templates are not much detailed usually and you will generally have 2 or 3 broad sections to jot down the news reports or information about the event, if any. playandlearn.com | Download preschool newsletter sample which has an amazing colorful, attractive look with yellow and pink borders, blue background and white cells for contents along with descriptive cartoon pictures for publishing notices to parents of preschool kids. 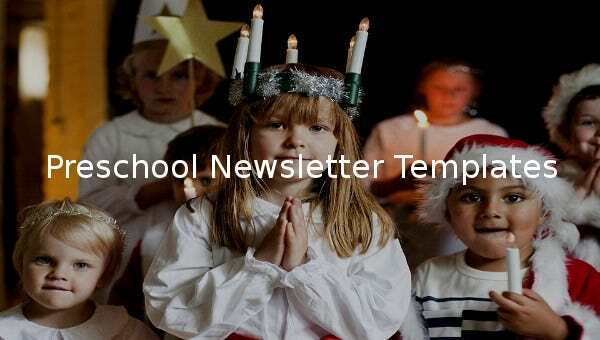 thecomo.org | Sample preschool newsletter template free download will help you create effective newsletters for preschool kids and their parents. It comes with blank blocks for adding contents like activities, announcements etc. and also has little heart shapes on corner of some blocks to give them an adorable look. 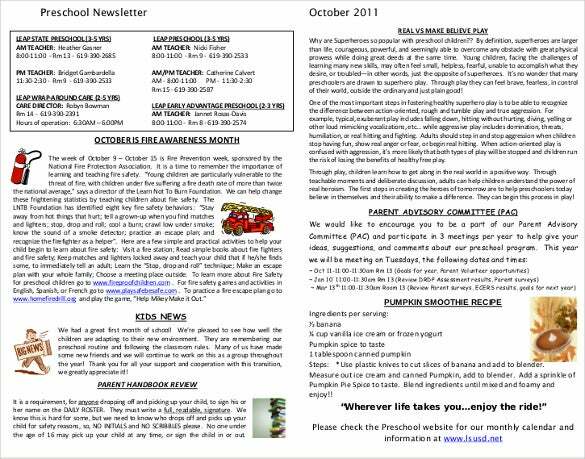 Preschool newsletter template free has a black and white, clean content format that also includes examples for each of the given blocks. It also includes graphics and logos to make the content more effective. 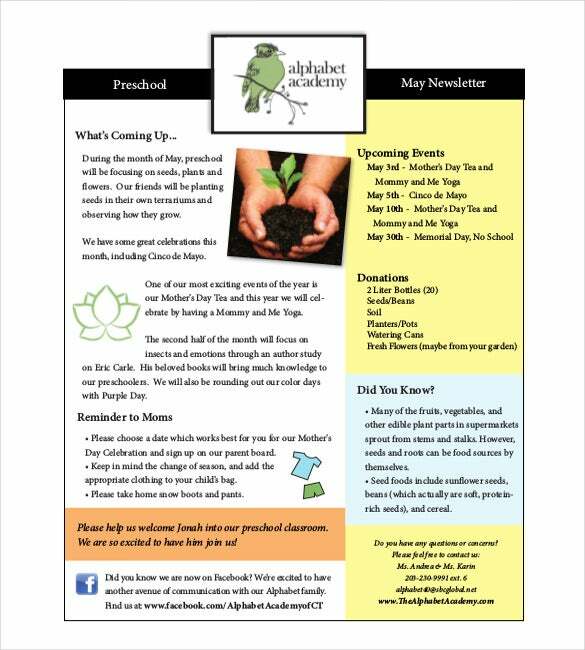 thealphabetacademy.com | Preschool newsletter samples download emphasizes on simplicity as well as catchy design to publicize notices, events and activities etc. It has a very basic design with yellow, orange, blue and white boxes to add the contents. The pre-included example will help you to make proper use of the content spaces. 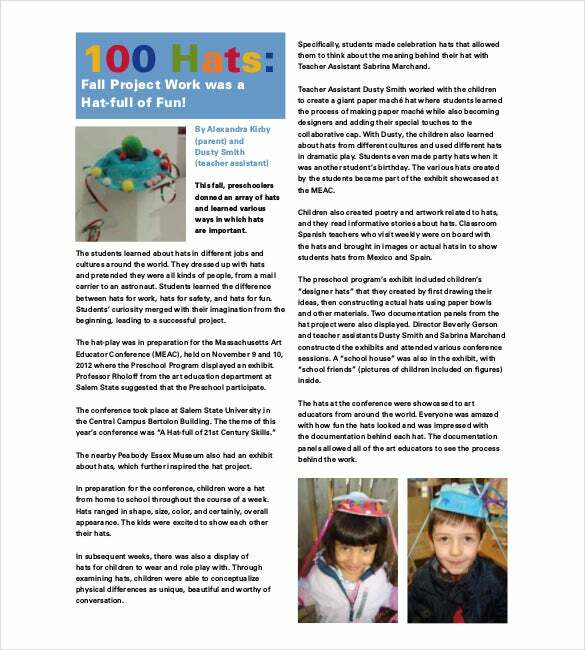 salemstate.edu | Weekly preschool newsletter template free download will provide you with a good example for creating weekly activities notices and performance results for preschool toddlers. It includes adorable pictures which make it really engaging. 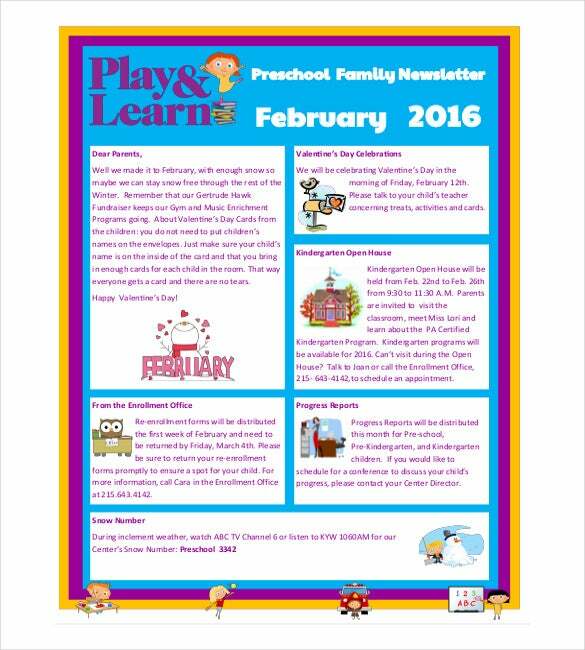 playandlearn.com | Download free printable newsletter template to inform schedules of classes for every month. 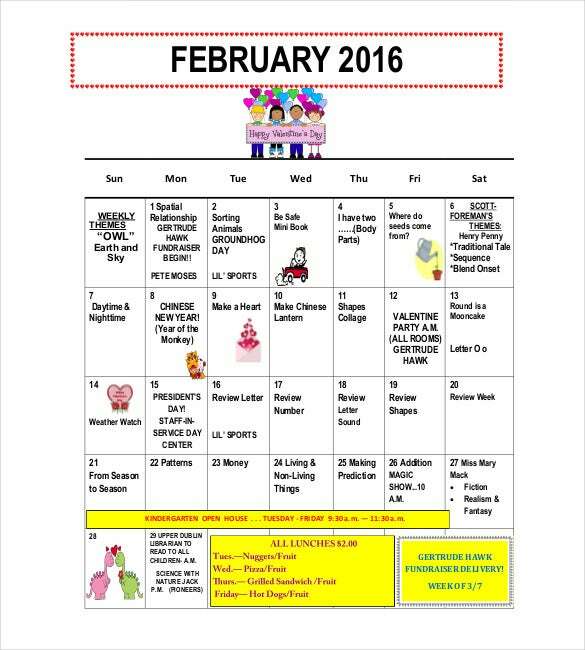 It can be used by particular teachers as well as by the school to notify important event dates in a colorful tabular format. 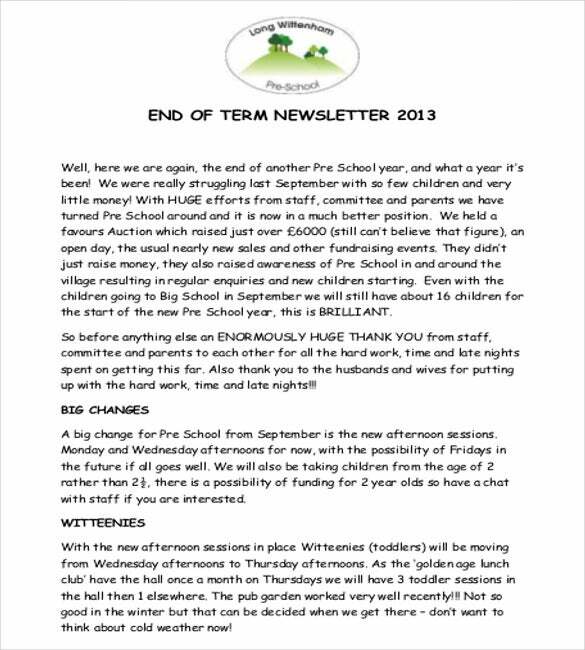 longwittenhampreschool.co.uk | Sample end of the year preschool newsletter template comes with a logo on the top, then the heading, introduction, followed by subheadings and respective contents. You can use this to get ideas on contexts and also use the example contents for your own similar newsletters. bifskorea.org | Beginning of the year preschool newsletter sample is designed specifically for preschool schedules, important dates, letter to parents and much more in an attractive design which needs to be publicized before every new session starts. Download now! usd261.com | School newsletter template sample download comes with an amazing red border on all the sides and spaciously arranged contents that are easy to view. It also includes some cartoon pictures and colored blocks for highlighting important details. 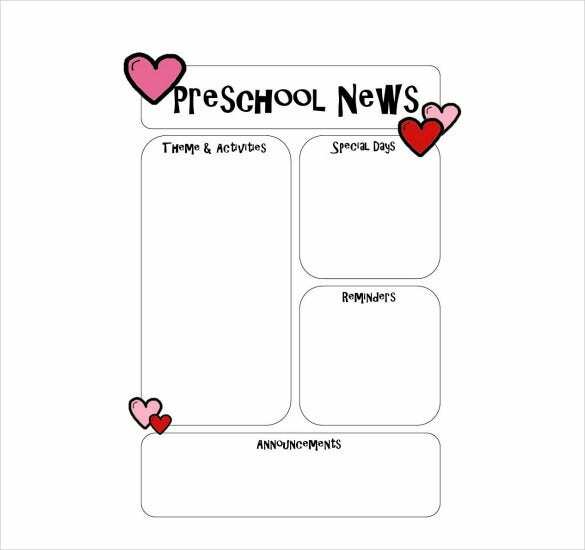 lsusd.net | Free printable preschool newsletter template sample download will provide you with a example that has blocks and details for smoothie recipe, fire safety, dates of important events etc. It has a very clean, paragraph style formatting.